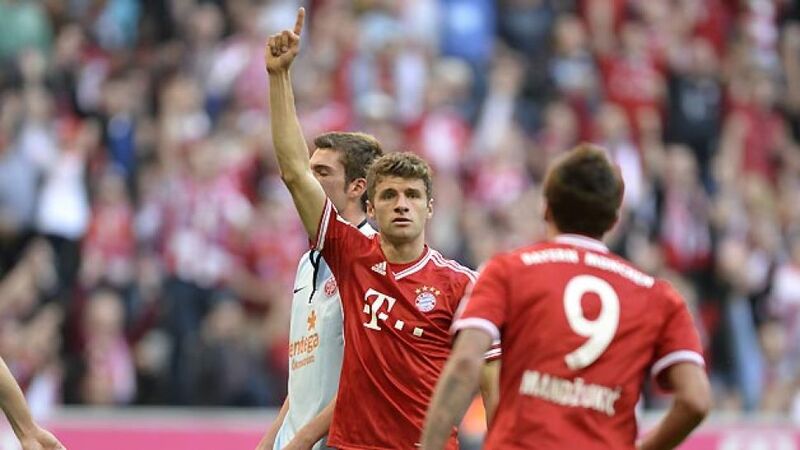 Munich - FC Bayern München's two-goal hero Thomas Müller hailed the introduction of Mario Götze from the bench as the inspiration for their 4-1 victory over 1. FSV Mainz at the Allianz Arena. His Bayern team-mates all agreed the German record champions were much improved after half-time, while Mainz's players were left to rue what might have been after taking a first-half lead. Thomas Müller: Mario Götze increased our attacking threat in the second half and we were also more solid at the back after the break when we suddenly managed to find space. Perhaps Mainz ran out of energy, but it was definitely easier in the second half. Philipp Lahm: We changed a few things at half-time, not only in terms of personnel, but also how we operate across the pitch. The changes paid dividends and we were able to create clear opportunities to score, which we took full advantage of. Arjen Robben: The first half was difficult and we didn’t do very well. We made too many technical mistakes and misplaced passes, but we fought well and played much better in the second half. We created a bit more space and if you fight until the end, you usually deserve to win. Christian Wetklo: It was very difficult. They had to try and force us out and then, of course, if one person is caught out of position, the ball is played through. It’s completely different when you play against Bayern - you can have six or seven people at the back and they still manage to break through. Niki Zimling: I think the first half was exceptional. In the second half, they pushed on, changed the way they play a little bit and scored some goals. I believe it was still a good effort by our team.